These grids can be used for Regular Season Football, Basketball, Baseball, and Hockey along with the Super Bowl and even the entire March Madness Tournament. Click the links on the right side of your screen to get detailed instructions for each sport. 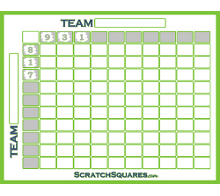 Once you receive your grids fill in the two team names, this is typically done by placing the home team in the top box and the away team in the box on the left side. 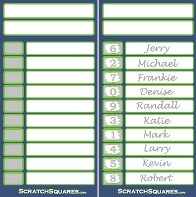 Have participants write their name in the square or squares of their choice. There should be a winning square at the end of each quarter. 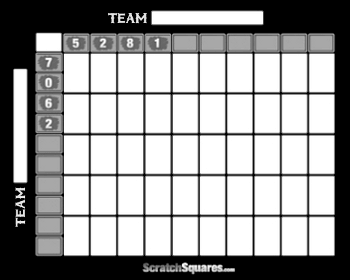 There are also many variations to declaring winners, such as every square touching a winning square is also a winner or the reverse of the winning numbers is also a winner. There are no set rules, you can get creative when determining winners, just be sure all of the rules are explained before the pool begins.